Amber’s debut album, Still I Rise, is passionate, beautiful, and a cry of the heart for one and for many. One will find a love story in the lyrics; a love story about the pursuit of God, knowing not only that He will not disappoint, but that he has already been pursuing us. The album’s sound is intense and beautiful. The lyrics communicate an experience with God’s overpowering love. The music boasts a rich diversity of sounds and styles. Piano, guitar and percussion are the staples of this album but Amber’s soaring voice is paired with much creatively textured instrumentation. Listeners of John Mark McMillan, Mute Math, and Misty Edwards may enjoy some of the musical similarities. Loud driving moments feature the wailing guitars and crashing cymbals that accompany the chorus of “Like You Promised”, the growing wall of sound that comes in like a tidal wave in “Branded”, and anthemic album closer “Heavenly Places”. Tight discordant harmonies segue into richer resolved ones as they accompany a farewell to unfulfilment in “To Whom It May Concern”. Intricate rhythm patterns fill “Hallelujah, Still I Rise” and “Vagabonds”. Out of Amber’s aim to put words to the experience of God’s consuming love come lines like, “I don’t have all the right words to say / to provoke you to want me / any more than you already do” (“Like You Promised”) and “why are you begging him for mercy / when you could be rejoicing? / The love of a Father has brought you home” (Why Are You Weeping”). God is near, she reminds us, and his heart towards us does not grow cold because what we do or do not do. His heart is always set towards relationship and reunion. Craig Ketchum: As I listen to the album, I’m hearing echoes of many different artists and styles. Tell me about some of the influences you have had in songwriting. Amber Brooks: I grew up on a lot of different genres of music, from rock, to rap, to gospel, to classical. The list goes on. I love style and diversity. Anything from Radiohead to Ella Fitzgerald, you can hear glimpses of them and everything between somewhere on the album as far as sound is concerned. Lyrically, I’m wanting to learn how to say things the way they’ve never been said…but still make sense. I’m trying to learn to communicate things that make people think. Sometimes, we sing and say groups of words that roll off our tongues very quickly because we’re used to saying certain things a certain way. I want words to get their meat back. That’s a learning process for me, I’m getting there slowly. Philosophically and thematically, I was expressing my heart towards God and understanding His heart towards His kids. I might not always get it right, but like I said, I’m learning. I hear the incorporation of different genres too. There’s some really gritty southern rock flowing through the album, but it’s interpolated with contemplative piano, folksy and country vibes, and such. I went into making the album knowing that I wanted a lot of diversity, and I knew I would get it with who all played on the album. I always like to hear what people bring to the table based out of their own creative ability. Did you open up your compositions to their creative play? The producer, Elijah Mosely, and I just wanted to let the creative musician be themselves and interpret the sound the way they felt it. 9 times out of 10 it was absolutely incredible and added more personality to the song. It was honest and raw, which is the way music is supposed to sound. Describe the preparation, rehearsal and recording process behind this, your debut album. It all started with me sitting down with Elijah for a few days just hashing out my influences and getting acoustic cuts of each song. We basically treated it like a science project from there. Throwing away some sections of songs and moving things around; writing lines that make you think and so forth. The songs were already breathing but a lot of the album arrangements were built organically. The recording process was meticulous, which I appreciate in the long run. We would literally spend hours on sections of a song that ended up lasting 30 seconds or less. I had been in a studio before doing backing vocals for other artists, but I never realized how complex making a studio album could be. What instruments do you play and what do you like about each? What do you compose on? I play piano and acoustic guitar. I pretend to know how to play other things but those are my main instruments. I mainly compose on guitar, I’ve been playing guitar for about 6 years and I’ve never had lessons. I just play out what I hear in my head. I enjoy playing piano much more. It’s my “happy place”. I could get lost sitting at a piano for hours just making up little things and learning classical songs by ear. I remember being 2 years old and beating on a piano and screaming at the top of my little lungs having the time of my life. Nothing has changed really. The album is a really interesting collection, renditions of hymns, parables…could you speak to its themes and content? Essentially, the album is a compound of 2 years of my life. 2 years of living is a lot of experiences that can seem to last a while. Out of those experiences came a song. The songs weren’t meant to be thematic in nature, it’s just where I was in my walk with the Lord at the time. What have been some of the most significant teachings or revelations that have shaped you as a worship leader (and thus shaped this album)? Amber: I think the most amazing thing that was taught to me as an artist was “write like yourself, sound like yourself, create like yourself and don’t be afraid to be honest about it” When we start to walk in the slightest glimpse of who God created us to be, that in itself is worship. It’s not just the 3 or 4 songs we might sing on Sunday morning before the offering is taken up. 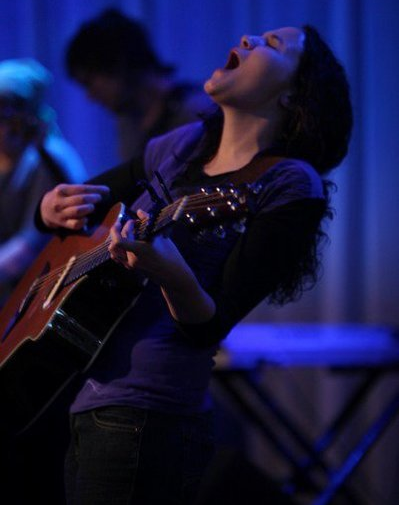 What I do when I lead worship (as it is with every worshipper) is a direct result of my relationship with the Lord. It’s honest, it’s raw, it’s vulnerable, it’s beautifully terrifying, it can be wild; but that’s what Love does to people. We are individuals for a purpose. We all interpret things differently, and that’s okay. God loves diversity; if He didn’t, we’d all be robots. What do you hope this album brings to its listeners? The title itself hopefully encapsulated the mood of the album. It’s about the overcomer. Overcoming fear, heartache, disappointment, false responsibilities, loss, fear of failure, thru knowing God’s heart for His children, not only as a whole but individually. The attitude of “circumstances won’t shut my voice down from loving the Lord”. My hope for the album the whole time was and is intended to bring hope itself. Encouraging people that life is going to be life and sometimes it’s not fair and sometimes we won’t understand everything; but God’s love is bigger than our understanding. His love is bigger than any circumstances and the whole time we are walking out our relationship with the Lord and learning how to love more, He is cheering us on the whole way, even when we mess up…no…especially when we mess up. What do the words “worship” and “worship arts” mean to you? Worship is a loaded word in my opinion. It’s complete adoration to something that you put your faith, hope and trust in. It’s not just an outward expression; it’s a posture of your heart, mind and emotions towards a God that we don’t always understand. Worship is loving and trusting God when it’s hard to. Worship is believing and honoring God when it feels hard. Worship is adoration. Like I said before, it’s not always music and it’s not an experience in a moment. It all boils down to recklessly messy love for God in who He is. Worship Arts is individual expressions of that. You are a graduate of MorningStar University. What has it opened you up to? MorningStar was literally life changing. It taught me how to search the deep things of God out for myself in a safe place and encourage me to step out into giftings and experiences that I never thought I would have. Worship leading is a prime example of that. Since I was 13 years old, I was always a back up singer. When I came to MorningStar, I decided I’d audition for back up singing, since that was what I always did; and Leonard Jones (the worship leader) saw potential in me, and encouraged me to dive a little deeper in writing and music. And I’ve continued to grow ever since. It’s opened up a lot of opportunities for me, an album being one of them as well as ministry trips and being on GodTV. I’m really grateful to have the opportunity to share my heart towards God with the masses. It’s very humbling.